There is no dearth of impressive student projects here at the finals of Microsoft’s Imagine Cup in Sydney, but one of the six finalists that caught my attention was a project called EnableTalk by the Ukrainian team QuadSquad. There are currently about 40 million deaf, mute and deaf-mute people and many of them use sign language to communicate, but there are very few people who actually understand sign language. 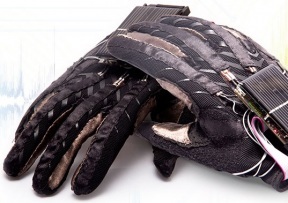 Using gloves fitted with flex sensors, touch sensors, gyroscopes and accelerometers (as well as some solar cells to increase battery life) the EnableTalk team has built a system that can translate sign language into text and then into spoken words using a text-to-speech engine. The whole system then connects to a smartphone over Bluetooth. But even that won't be the ultimate solution. The ultimate solution will turn thought into speech, which will then be translated back into impressions directly into the brain. At that point it won't matter whether a person is deaf or mute or, for that matter, what language he or she speaks. If we can turn thought into speech and then back into thought, real-time translation will probably already be a solved problem. Then we'll just need to make sure we have good controls for "volume" and "mute." We certainly don't want anyone in our heads who wasn't invited! I surely hope there'll be some on/off controls on this telepathy. I just came from a meeting, and I would hate for my thoughts about its uselessness to have been projected into the minds of some of the people there. It should work so that only what you want to send gets sent, and then only to who you want it sent to. Like email, only with your brain. ψmail. And you want to be really careful with that mental version of Reply All.